Rigel II is the newest and biggest member of the Ventouris ferries fleet and has a passenger capacity of 1800 and its garages can hold up to 500 vehicles. Ventouris ferries have established a tradition of creating luxurious, comfortable, fast and safe ferries and the Rigel II certainly has all those qualities and more. On board you will find 550 beds for a comfortable night’s sleep, a restaurant, café-bar, self-service restaurant, duty free shop and Wi-Fi connection. Please Note: Whilst we have taken great care in making our Rigel II guide as accurate as possible, onboard facilities, services and entertainment may vary depending on the date and time of year that you travel, facilities mentioned may change without notification and ferry companies reserve the right to operate vessels other than those mentioned at time of booking without prior notification. 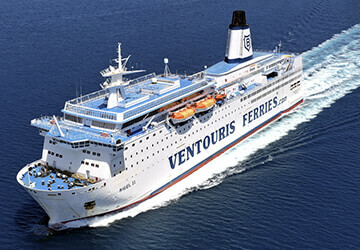 It was my first time on a ferry and I can say that it was a good to great experience travelling with Ventouris. I would definitely recommend it. Very fast trip, excellent organization, friendly crew. "Trip from Bari to Durres"
Excellent trip and even better on the return with Riger II. I do this crossing every year. I have nothing to say. All excellent. Clean cabin, all services on board. Perhaps you should improve the organization during the landing. Apart from that all good.